Enterprise leaders have gradually started to realize how important IoT is to their companies. IoT is a network of internet-connected devices, provided with the ability to collect and transfer data across a network. The insertions of sensors, communication devices and identity chips that are continuously intersecting with cloud and analytics engines have resulted in a new age of automation in businesses. IoT delivers constant feedback and facilitates better decision-making for businesses of all sizes. IoT platform is transforming industries like healthcare, energy, automotive, manufacturing, and transportation as well as countless appliances like air tracking, door well cam, security system, electricity plug, thermostat, oven and hundreds of others. So, how is IoT technology transforming your business? 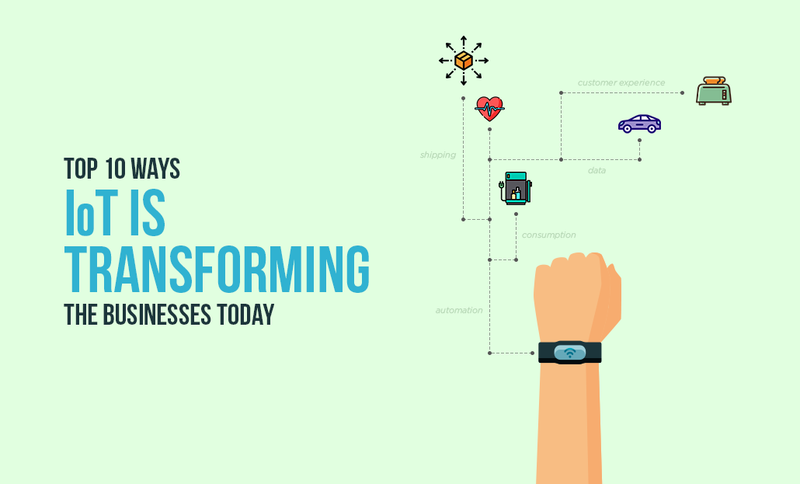 This blog highlights 10 notable ways that business is transforming with IoT. Where is the IoT Market Heading to Next? In recent times, the IoT technology solution has moved from the pilot stage to driving business value as it plays a vital role in the digital transformation. The continuous growth of this industry will turn out to be a digitization force across all enterprises. 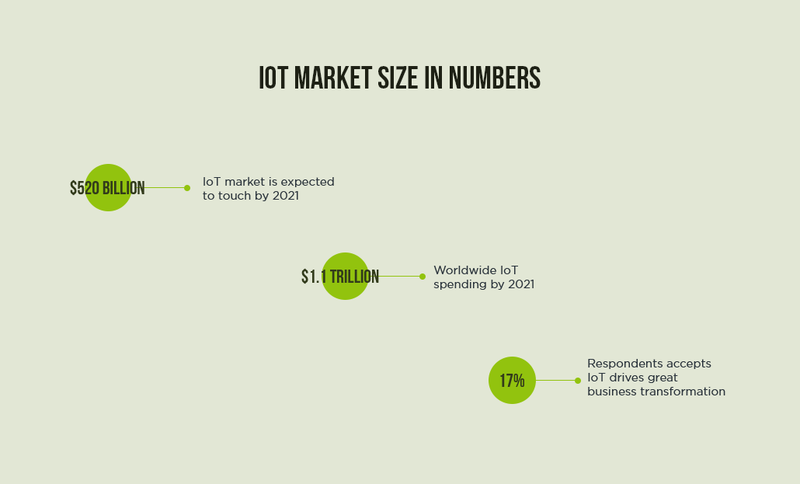 By connecting all of our devices with the internet, the IoT market (including IoT software, hardware, system integration, and data & telecom services) is on speed to grow and is expected to touch $520 billion by 2021, according to bain insight. In addition, the IDC projects that the worldwide spending of IoT will hit $1.1 trillion by 2021 with a compound annual growth rate of 13.6%. The response of the innovation survey by KPMG provides evidence that IoT is the top technology unlocking massive opportunities. Nearly, 17% of the respondents stated that IoT drives the most significant business transformation. How IoT is Transforming Business? Do you face problems with inventory tracking and management? Are you losing millions of dollars due to assets getting lost? Are your workers excessively engaged in solving inventory-related matters? IoT applications can enable you to manage your inventory by granting some automatic control options. Similarly, tracking asset in the supply chain with IoT can be an ideal solution to catch the assets that went missing in transit. Installing IoT products and software in your warehouses and storage units can aid you to manage inventory changes. Moreover, embedding surveillance systems with IoT and analytics can prevent theft before it takes place. For example, Amazon increases its shipping capacity by engaging WiFi robots that scan QR codes on its products and track its order. All most all businesses function with the assistance of data collection and transmission, and the IoT adoption has completely revolutionized how data is processed. Apart from allowing greater access to user data, IoT applications can track the patterns in which a user connects with the device. By learning from the patterns, the device becomes smarter and offers a better user experience. Simultaneously, IoT products support businesses in deciphering that data for company growth. You can use the data to study consumer requirements, buyer cycle, the scope for enhancement & inventions and approaches for marketing & advertising. Companies not only develop products but also monitor their product’s performance, all thanks to the predictive maintenance algorithm embedded in the IoT platform. The feasibility to transfer the IoT data across the organization’s ecosystem of customers and partners enables new paths of innovation in the form of continuous engagement and value-added services. For example, John Deere, a farm equipment manufacturer employs the IoT in various ways to provide new as well as innovative products to their customers. These include self-driving tractors, intelligent farming solutions and more where sensors constantly monitor crop levels & soil health and offer farmers advice on what crops to plant and what fertilizer to use. As enterprise can ingest, process, visualize and respond to huge volumes & variety of data they can ultimately build strategies to meet customers’ needs. With the internet-connected devices, they are obtaining a 360-degree view of their customers’ preferences and building campaigns that drive revenue from the audiences. Further, it helps to segment customer base, generate customized offers for boosting the customer satisfaction rate, and enhance their experience. Real-time data from processes, devices and people via sensors is revolutionizing businesses; since visibility into what is really going on can be a game changer. We are already observing innovation across the core sectors, especially in retail. By gaining real-time insights of buyers, retailers can stock products on-shelf and increase their profits with efficient sales and stock management. The Internet of Things plays a key role in interconnecting devices like systems & smart cameras, to work collaboratively. Thereby, a business can make intelligent decisions, eventually acquiring innovations in business models that help to accomplish its business goals. For example, Livestock monitoring deals with animal farming. With IoT applications, ranchers can collect data about the well-being of the cattle. By knowing timely about the sick animal, they can whip out and prevent a large multiplicity of sick cattle. Omni-channel approach to sales is highly acceptable today as it streamlines the entire shopping experience. IoT plays a major role in facilitating this service and improves the user experience manifold. Due to the incorporation of sensors on internet-connected devices, the organizations or manufacturers are facilitated to supervise the operations, status and service levels from remote locations and offer prompt support as and when customer demands. Beyond everything, customers always demand quick deliveries. Most of the business partners like logistics service providers and suppliers apply IoT technology solutions to ensure faster delivery of orders. Things don’t close at processing with a great speed only. Businesses also need high-level efficiency and productivity. With improved information about the market and consumers, you can increase the productivity of your business. In addition, IoT can support to orchestrate extensive automation and offer a real-time response on operational efficiency. These innovations will lead businesses to run cheaply and consequently, will expand the landscape intensely as insertion will be economical and manufacturing will become more feasible. If the customers won’t be delighted with your product, they will never provide positive feedback, which eventually leads to a decline in your market revenue. So how do you improve customer satisfaction? The feasible solution is building your product with the Internet of Things. By facilitating the support team with improved tools for monitoring the problems faced by the clients, IoT supports you to address and resolve them easily. In addition, the mass integration of chatbots and artificial intelligence with IoT, focus on customer satisfaction and offer enterprise owners with a unique gateway into the lives of customers. Chatbots synthesize data as well as spot certain issues with any service or product that can be improved. The inclusion of AI into the IoT operations provides customer relation managers with valuable data and offers customers with instant support; as such, they can use the products in a better way. Mercedes Benz’s Mercedes Me Connect is a perfect example of how the IoT connected cars can deliver top-notch in-car customer experience. This connected car enables customers to connect with the world using modern sensors and technologies like machine learning to complement its IoT features. As the customers realized the uses of IoT applications, they begin to demand new things. Intelligent refrigerators make grocery lists based on its stock, for example. These would have appeared clueless ten years ago. In the future, this will be a standard feature of refrigerators. The internet of things impact on business drives the changes in the consumption models. There are flexible consumption calls for the new business model that innovates how products are purchased. We have evolved from purchasing a product to pay-per-use. Thanks to IoT, it facilitates to measure the utilization of a product and charge by utilization. In scenario 1, the business owns the robot outright, spent for maintenance annually. 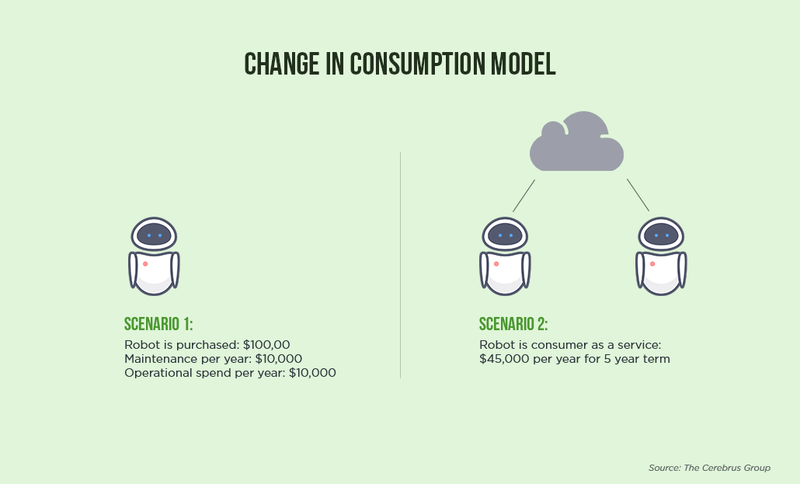 In scenario 2, the robot is hired as a service with a fixed subscription fee. With IoT, the business can measure robot utilization and pay per its utilization, beyond a simple subscription. You could have provided better maintenance for scenario 1 with IoT but wouldn’t have charged as per asset utilization and wouldn’t have played with cloud-connected robots. IoT allows you to obtain a consumption-centric tactic to build new offerings since you can measure consumption. The evidence on the benefit of IoT is clear, and it is about to alter how can internet of things helps business. It not only increases efficiency and revenue but also guarantees the best services and products reach customers at the right time. Companies, which have adopted IoT, have witnessed increased opportunities for the business by enabling them to be more responsive to customer needs. That means enabling business with IoT devices could place you on the front-line of evolving trends of business customer interaction.